Retro-fitting and existing home with a range of features including strong and solid security doors and loads of special concretes can be very effective. In a country where many houses are subject to the dangers of being destroyed each year, the investment is common sense. Building a home from scratch to be cyclone proof also has a number of advantages including super strength. A look at cyclone proofing a home. Not only are the homes very resistant to insane wind and rain strengths, they are very energy efficient and defend well against pest attack. Filling the Walls. Structural integrity is increased with special concretes to fill external walls, including steel in the frame. Insulated concrete forms are the most common form of material used to make a wall from scratch. These also include steel frames. Many modern houses are now being built with steel frames, which are very durable and have less movement in the first place. You will notice that there are near no cracks on the interior paint where the walls and ceiling meet even after a number of years. If you are going to build a new house, go for a steel frame. Roof. Again wood-less roofs are the best. The best roofs are made of modern steels that fit snugly into place. The aim is to keep the home air tight, and it is good to avoid having hot water systems in the ceiling. Temporary (or even permanent) steel harnesses can be very effective against winds and ensure your roof stays attached. Exteriors. Exteriors should not have items such as water tanks as these can be ripped away and rip away the wall or roof. If items must be installed, strong coverings that seal them against the wall or roof so that air passes around them will greatly help. Smooth and curved surfaces will have good effect. Windows and doors. Cyclone force winds create a vacuum over your home as they pass over. Having strong doors and secure windows that are sealed tight will be energy efficient and defend against damage. Having modern security screens to reinforce your windows are not only good for cyclones they can protect you against unwanted guests. If your windows and doors blow away, air pressure builds inside your home and your ceiling and roof comes under attack. Doors and windows are extremely important, and are often the cause of much other damage. The higher impact resistance your doors and windows have the better they will be at defending you against cyclone. Multiple bolts will also aid this. Garage doors are often overlooked and reinforcement is critical. Houses Off The Ground. 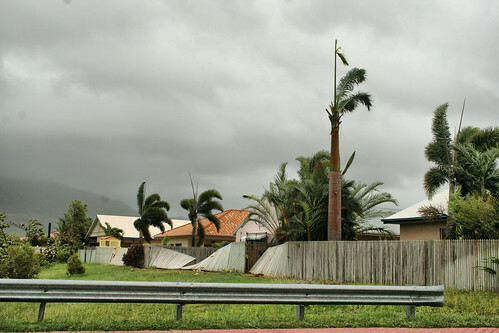 Many houses in cyclone prone areas are built off the ground to protect them against other problems of water – cyclones are often in more tropical areas. Making sure your home is securely attached to the ground, and even sealing the area from the ground to the house will make a great improvement. Super strong cables from the roof to the ground will also help. Cyclone proofing does not have to be that expensive and will give your home the added advantage of being burglar proof and extremely energy efficient.